We are a leading Wholesale Trader of dhootapapeshwar vasant kusumakar rasa suvarnakalpa 30 tablet, dhootapapeshwar bruhat vata chintamani rasa suvarnakalpa 30, dhootapapeshwar sootashekhar rasa suvarnakalpa 30 tablets, avp malathyadi coconut hair oil, dhootapapeshwar hrudayrog chintamani ras and dhootapapeshwar makardhwaja gutika suvarnakalpa 30 tablets from Mumbai, India. This is useful medicine in diabetes, specially used in various diabetic complications. Along with nourishing all seven dhatus, it acts as a good rejuvenator, with suvarna bhasma as one of its ingredients; it is one of the best lines of treatment in patients having diabetes with cardiovascular diseases. Naga & Vanga bhasmas tone up the nervous system as well loha and pravala bhasmas acts as good hematinic. The other ingredients like mouktik (Mukta0 bhasma, rajata bhasma and abhraka bhasma also act as excellent rasayan and controls the vitiated Vata. 1. Elemental assay for Suvarna (Gold) to be 5.12% to 7.36% in formulation is assured and Shastra Shuddha Suvarna Bhasma geneally has not less than 95% elemental gold. 2. Elemental assay for Rajata (Silver) to be 3.2% to 8.0% in formulation is assured and Shastra Shuddha Rajata Bhasma geneally has not less than 70% elemental Silver. 3. Elemental assay for Naga (Lead) to be 5.6% to 8.0% in formulation is assured and Shastra Shuddha Naga Bhasma geneally has not less than 70% elemental Lead. 4. Elemental assay for Kantaloha (Iron) to be 4.0% to 8.8% in formulation is assured and Shastra Shuddha Kantaloha Bhasma geneally has not less than 60% elemental Iron. 1. Elemental assay for Suvarna (Gold) to be 10.0% to 12.0% in formulation is assured and Shastra Shuddha Suvarna Bhasma geneally has not less than 95% elemental gold. 2. Elemental assay for Rajata (Silver) to be 4.8% to 7.2% in formulation is assured and Shastra Shuddha Silver Bhasma geneally has not less than 55% elemental silver. 3. Elemental assay for Loha (Iron) to be 6.4% to 12.0% in formulation is assured and Shastra Shuddha Iron Bhasma geneally has not less than 55% elemental iron. A product specifically meant for acid-peptic disorders. 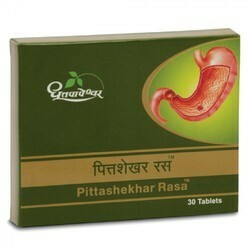 Very potent product for hyper acidity along with other symptoms like burning in chest or stomach, vomiting, headache etc. an anti-toxic, blood purifier and cardiac booster, suvarna bhasma helps in nourishing all the body elements as well as improving the immune system in the body. 1. Elemental assay for Suvarna (Gold) to be 4.32% to 5.92% in formulation is assured and Shastra Shuddha Suvarna Bhasma geneally has not less than 95% elemental gold. 2. Elemental assay for Tamra (Copper) to be 1.92% to 4.00% in formulation is assured and Shastra Shuddha Suvarna Bhasma geneally has not less than 55% elemental copper. Malathyadi Oil is an effective Ayurveda herbal oil for hair care with coconut oil as a base oil. It is useful in Alopecia, hair fall and dandruff problem. During winter season, just place the oil bottle in hot water for 5-10 minutes to make it liquid since coconut oil has a tendency to solidify in colder temperatures. 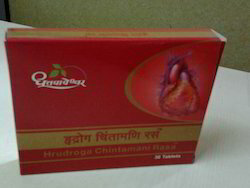 Quality is the hallmark of our industry, to maintain excellent quality standards we are engaged in offering a wide range of Hrudayrog Chintamani Ras. It is processed by our vendors using best quality ingredients and advanced technology to render maximum client satisfaction. Furthermore, it is mostly used in prevention from heart attacks and is available in market in well packaging and affordable prices. A time tested Rasayan with purest Suvarna (Svarna) Bhasma, it nourishes all Dhatu as well as Ojas. It is useful in the conditions which arise due to Chronic Disorders and Mental Fatigue. As being a potent Rasayan & Sptadhatuposhak it increases Vigour and Vitality. Please refer to shree dhootapeshwar standards (SDS) monograph for details on standardiston. With vast experience and knowledge we are involved in offering a premium quality range of Dhootapapeshwar Pittashekhar Rasa. Offered product is made using best quality ingredient and herbs to meet the variegated preferences of our clients. Our vendors process these syrups keeping in mind the global medicinal standards and norms. Additionally, we assure safe and timely delivery of our products. Being the leading names in industry we are offering a wide assortment of Dhootapapeshwar Madhumeha Kusumakar Rasa. Offered product range is formulated using the best quality basic chemicals and latest technology as per the global standards. 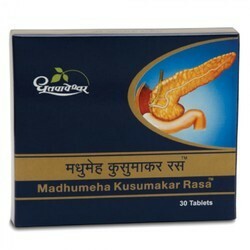 It regulates blood sugar level and free from risk of hypoglycemia. Offered ras regulates insulin secretion, checks over fatigue, blood purifier and also acts as a wound healer.